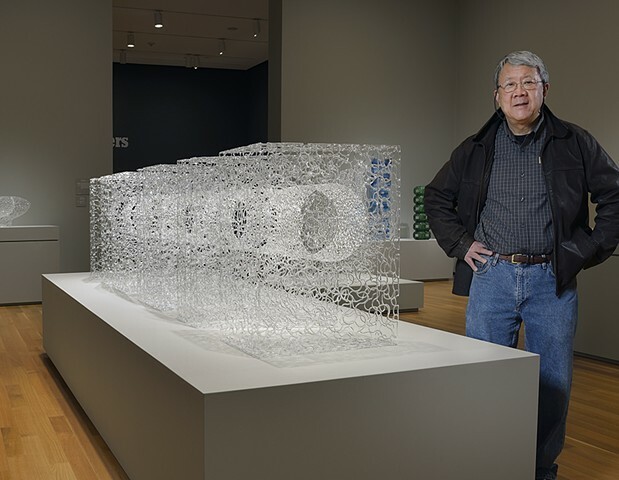 Brent Kee Young, glass artist and Cleveland Institute of Art professor emeritus, has been recognized by scores of museums, galleries, colleges and universities in the United States and Asia, which have displayed and acquired his work and invited him to speak, demonstrate and teach. In 2006, the Smithsonian American Art Museums Renwick Gallery acquired its second piece by Professor Young for its permanent collection. Amphora....Save is from Professor Youngs Matrix Series, a construction of intricate and technically complex works he created by flame working borosilicate glass rods into layers of glass webs. Also in 2011, Professor Young was selected to receive a most prestigious Creative Workforce Fellowship, generously supported by the citizens of Cuyahoga County, Ohio where he lives and works. In 2012 his work was published in 50 Years of Studio Glass, a selection of 50 top glass artists working world-wide. Image: Brent with Matrix Series: "Cubism, Contiguous Lineage.... Interrupted", 2012, Akron Art Museum, OH. Now collection of Imagine Museum, St. Petersburg, FL.